One of the biggest impacts chatbots are expected to make on society will be in the medical field. The newly launched DrCHAT.ai (in beta) is a prime example. DrCHAT provides patients with medical consultations prior to initial doctor’s visits, or a second opinion afterwards. Free usage and the ubiquitous availability of DrCHAT allows patients to continue consultation at every stage of treatment. This empowers women, with a number of benefits to the entire health ecosystem, and it presents unlimited potential for the use of technology such as DrChat to improve the nexus between patients and care. The only obstacle for chatbots becoming virtual doctors is the ability to handle consultation dialogue similar to what occurs in a doctor’s office. The dialogue obstacle is a major challenge, and solving it will determine who wins the race to claim this value service space. In the case of DrCHAT, the expertise is derived from certified Ob/Gyn physicians who have laid out over 30 different clinical flows – following American College of Obstetricians & Gynecologists guidelines for evidence-based care. Although the machine learning process continues its growth, some beta-testers have been granted early access to DrCHAT. 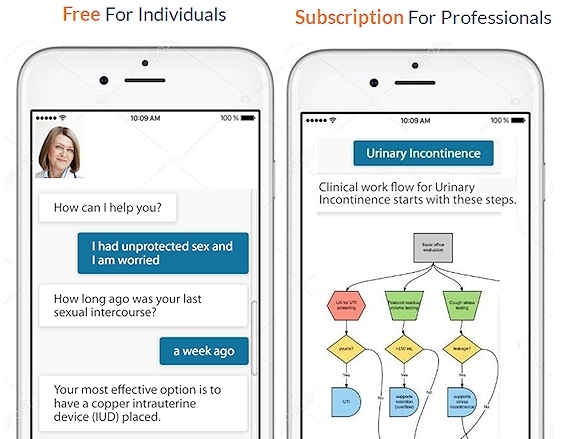 One of the striking differences between flat (single-step) searches using Google, WebMD, or Wikipedia and a medical chatbot such as DrCHAT is the consultation dialogue, in which clinical work flows are utilized to allow a step-by-step conversation to diagnose illnesses and suggest treatment options. Considering the popular usage of mobile devices and messaging apps, consultation dialogue offers the richest and quickest experience compared to opening documents and sifting through large volumes of text on a narrow screen. Single-step search engines fall short for health problems that require multi-step interaction with a patient to suggest diagnosis and treatment options. Some current health apps, including ADA, Babylon, and YourMD, offer valuable services such as scheduling visits or video conferencing with doctors. However, their chatbot interactions are imitations of a single-step search with no genuine dialogue capability. The fact that these apps are geared toward “general medicine” to cover everything without specialization makes them less capable of delivering the requested consultation. Medicine is such a vast topic that automated consultation is best handled by specialized expertise. Another important feature of DrCHAT is that it comes in two versions, one for patients and the other for professionals. Although derived from the same expertise (IP), the professional version lays out the clinical flows for decision-making which is a valuable reminder, fact-checker, and a quick guide for practitioners. The complexity of the medical terminology used during a dialogue also differs between the two versions. Most Ob/Gyn specialists agree that women do not always feel comfortable talking about their intimate problems, and sometimes skip mentioning critical details during face-to-face consultation. DrCHAT’s approach of anonymous dialogue, without any registration, will break down some of these barriers and further empower women during these exchanges. In return, conversation logs (without identity information) become a valuable source of information to analyze women’s behavior under a regular clinical examination. Where we go from here will be determined by the engagement and acceptance level of health chatbots such as DrCHAT. It is clear, however, that once the concept has been validated, other specialty areas may be replicated quickly by deploying the underlying technology – which focuses on automated knowledge acquisition from experts. Cardiology, Emergency Medicine, Pediatrics, and Urology (men’s health) are some of the specialties to be launched under DrCHAT following Women’s Health. If you want to be a tester, just talk to the chatbot and ask to become a tester. Stay tuned for more on health chatbots. CHAT WITH DrCHAT ABOUT women’s health. CHAT WITH VERA ABOUT EXCLONE. TRY FREE (NO CC REQUIRED) OF OUR CLONING PLATFORM VIA LINKEDIN ACCESS.